Free things first: I've got parts for 20 copies of the "Mk I" XOrduino and XO Stick. I'm mailing them out for free (!) in exchange for your development help. Send me an email at xorduino@gmail.com describing what you'd like to do with the XOrduino/XO Stick, and your full mailing address. Best 20 or so get kits. Test different configurations of the boards. What are the fewest components necessary for a functional XO Stick? What capacitors are really needed? 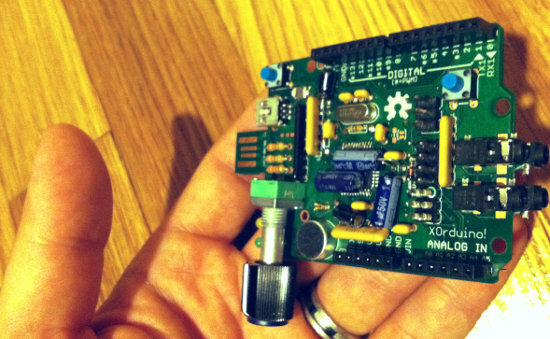 What's the smallest number of components needed to get the arduino IDE to talk to the XOrduino? Then add the components for the Scratch Sensor Board functionality, and test that with this Arduino sketch (some minor porting required). Try out whatever Arduino shields/old Arduino code you have lying around, and see if there are any gotchas there. Document it all, take photos and video, let me know about bugs and pitfalls. Write some killer education apps! These boards are meant specifically for teaching kids—take the Turtle Art with Sensors ideas as examples, and write up some lessons to teach science. Or take inspiration from the old school "fun with electronics" kits from Radio Shack and recreate some of the popular standbys: a burglar alarm for kids' tree fort, a light-sensitive alarm they can hide in their sibling's drawer, etc. Or a document how to program a robot (more on the robot below) with simple emergent behaviors—avoiding walls, turning toward light, fleeing loud sounds, etc. The Cubelets examples may give you ideas. Take photos and video. Arduino support for the XO Stick. There are a number of projects which add support for the ATtiny85 and friends to the Arduino IDE (for example, this one). Ideally we'd like to make the XO Stick as Arduino-compatible as possible, so we can reuse the excellent Arduino IDE, etc. This involves (a) porting an arduino-compatible bootloader (like usbAspLoader-tiny), as well as (b) porting the Arduino libraries to match the pinout/peripherals of the ATtiny85 and ATtiny861 (this page is a good start). Program an XO Stick from an XOrduino and vice versa. Ideally we'd like to bootstrap the initial chip programming, so that one programmed XOrduino (or XO Stick) can be used to put the initial bootloaders on the others. For technical reasons the XO Stick is probably best as a "clone tool": without interacting with the USB bus it would just copy its internal memory to another XO Stick. The XOrduino is a little easier, just a matter of adapting the existing Arduino sketches and documentation. Debrick an XO from the XO Stick. The XO Stick can talk to the EC programming bus to recover a bricked XO; it can probably also reprogram OpenFirmware. We need to write a bit of code to make it pain-free and document the process. This would make the XO Stick a useful repair accessory for XO deployments. 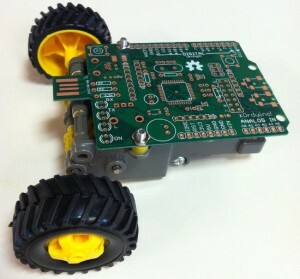 Scratch/Turtle Blocks support for the XOrduino and/or XO turtle bot (see below). Here's the exciting part two: I'm already working on the XOrduino and XO Stick "Mk II". The latest schematics/boards are in github (xostick, xorduino). The kits I'll be sending out this week correspond to the "A1" tag in those repositories; the "Mk II" revision is on the master branch. The XO Stick gets a minor change with big implications: instead of using a 20-pin header matching the ATtiny861 pinout, I've widened the board to give the XO Stick a standard Arduino shield connector (and some prototyping area). This opens the way for a port of the Arduino IDE (mentioned above), but it also means that the XO Stick can be mounted on top of an XOrduino. In a cost-conscious classroom environment, this allows a teacher to buy/make one copy of the XOrduino with all of its fancy peripherals (scratch sensors, robot support) and then give each student a copy of the cheaper XO Stick. The students share the XOrduino and swap out their XO Stick "brains" on top to control it or use its peripherals. Mating the two boards also makes it straightforward to program an XO Stick from an XOrduino, or to use the XO Stick's prototyping area to hack together a shield for the XOrduino. 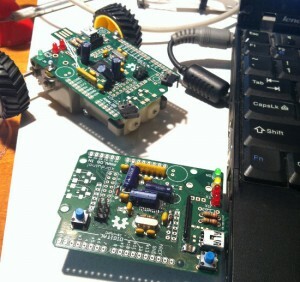 The XOrduino gets a more exciting feature (hinted at above) -- enough peripherals to become the XO Turtle Bot! This is a very low-cost turtle robot based on a Tamiya motor assembly. All of the extra robot components are optional—you can populate just the parts you want—but a classroom can now make their XOrduinos (or XO Stick + XOrduino base) into standalone turtle robots, controlled by Scratch, Turtle Art, or Arduino code. The XO Turtle Bot revision adds a motor driver, two bump switches, a simple 3-cell power supply, and rotation sensors for the motors to the XOrduino. (Arnan Sipitakiat and Nussarin Nusen in their Robo-Blocks presentation for IDC 2012 explained that children find "turn for two seconds" hard to understand; we include motor sensors so that we can "turn 90 degrees" instead.) And of course because the robot is based on XOrduino, you can add whatever other sensors you like and write arduino/Scratch/Turtle Blocks code for it. I'm excited about the potential of low-cost robotics and the Arduino platform for education. If you are, too, let me send you a kit so you can help out!